AnyIndo - In this article we are going to share an article it is Fix Smartfren Andromax Tab 7 Bootloop / Failed Booting Easily. Smartfren is one of android smartphone vendors and providers in Indonesia. Any android device which they take to the market very easily recognized, because they named their android devices "andromax". 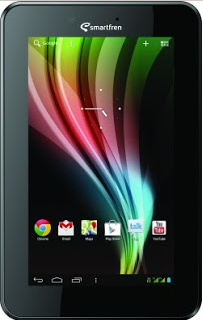 Andromax Tab 7.0 is one of their devices that popular enough in Indonesia. If you are having problems bootloop / fails to boot, it just shows the logo, the following tutorial is one solution to overcome these problems. Turn off the tab 7 Andromax you, hold the power button until the tab goes off. Next, go to recovery mode, just pressing volume up button (the button closest to the volume of power) and power button, press it button simultaneously. If you have entered into recovery mode, release all keys and press the power button for several seconds until the reset process is working. Done, you just fill out the data as you first enroll in android this tab. That'sall about Fix Smartfren Andromax Tab 7 Bootloop / Failed Booting Easily.If you have any question related to this article, you can leave comment bellow. If we are not busy, we will reply it as soon as possible. Belum ada tanggapan untuk "Fix Smartfren Andromax Tab 7 Bootloop / Failed Booting Easily"